Chart No. 34 - Pelvic and Hip Adjustments for Every Tender Area in the Glutei Region. 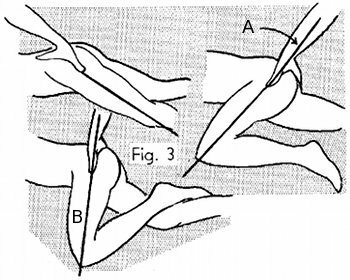 Draw a straight line from the tender spot found to the head of the femur. That gives the line of force for the position of the leg and the femur for the adjustment. These adjustments are not mere hip corrections but are a release for spastic tissue and bony relationship caused by it. Find the most tender spot in the dotted region over the glutei muscles. Three positions of the hand on the hip and the leg in relation thereto for a correction. 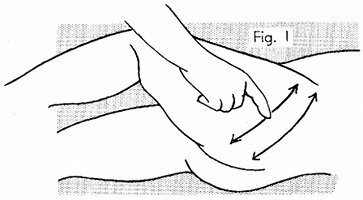 The lower lumbar and interpelvic structures and spasms are released by this simple adjustment. First however all anterior and perineal energy blocks of the pelvis should be removed. 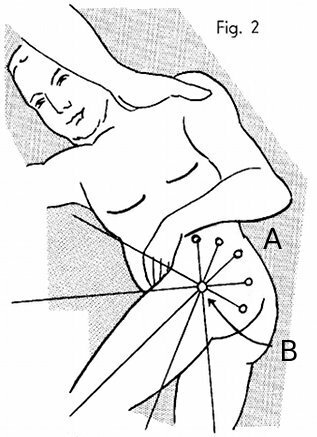 Both hands on the body for an adjustment, according to the lines of force. It is first a stretch, then a very mild natural correction with a very short range of adjustment, ½ [one-half] inch or less.